Over the past few days we introduced the notion that stereo, and the intricacies that make up stereo, may not be widely known to those enjoying her esteemed capabilities. So, in this dramatic conclusion, The Prudent Groove offers, without sarcastic interruption, the cliffhanging outcome to, What is STEREOPHONIC SOUND? 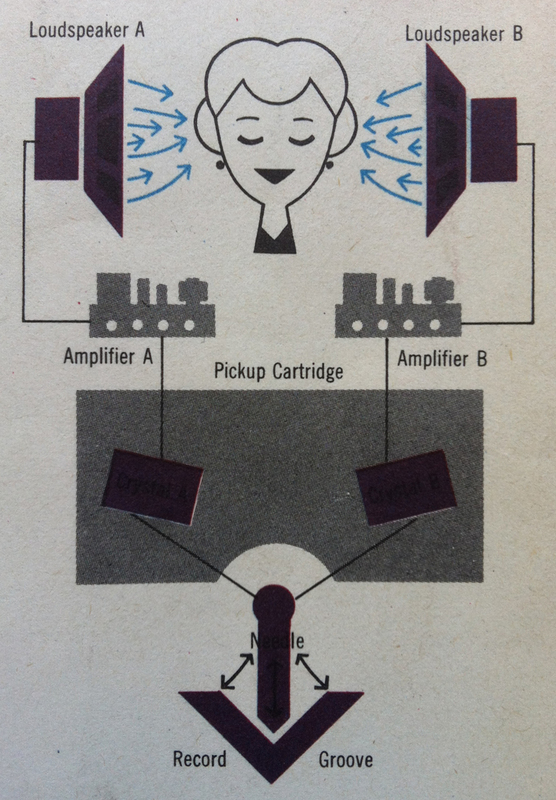 The two channels of sound picked up by the needle are then unscrambled by the stereo cartridge. The cartridge directs them into separate amplifier circuits, where they are magnified and fed in turn into two separate loudspeakers. The two speakers finally translate the musical impulses into intelligible sound which you hear in your living-room stereophonically. The net of it is an overlapping and blending which gives music a more natural, more dimensional sound. For the first time, your ears will be able to distinguish where each instrument and voice comes from-left, right or center. In short, enveloping in solid sound, you will hear music in truer perspective. Stereophonic sound is the latest step in an improvement process that began about 80 years ago. In listening to it, you will enjoy the highest achievement yet in the art of recording. Yesterday we inaugurated the intricate fascinations of Stereophonic Sound. 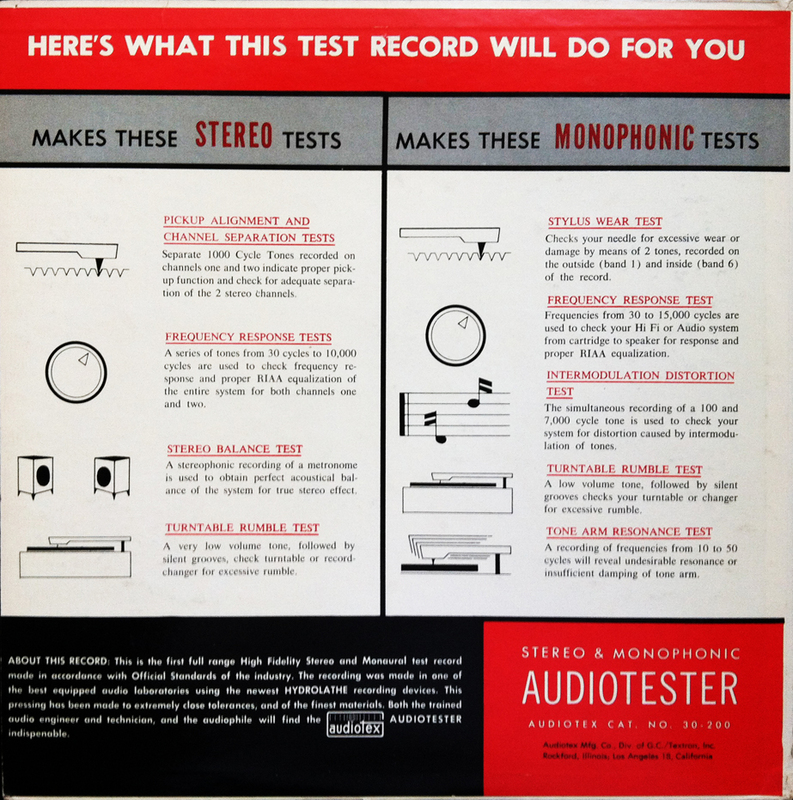 Today, we pick up where we left off and continue with RCA Victor’s detailed explanation of the technical differences between recording a monaural record with that of the stereophonic record. So, without further ado, I present part 2 (out of 3) of RCA Victor’s What is Stereophonic Sound? Let’s compare hearing to seeing for a moment. You see images on your left with your left eye, images on the right with your right eye. Yet, because your brain can do two jobs at one, you get a total unified picture in its true perspective. Stereo sound is simply the attempt to give you music as it is heard by both ears. Essentially, what happens is that two microphones, left and right, pick up what goes on in the orchestra at the recording session. These two microphones feed the musical impulses to two soundtracks on tape. The two soundtracks are then pressed into the grooves on a stereo record. The sound from a record partly depends upon how the needle moves or vibrates. For example, when Edison designed his phonograph to play cylindrical records, he made the needle vibrate up and down. This is called the “hill and dale” system, or vertical cutting. On a conventional, monaural record, however, the needle moves from side to side, or laterally. The lateral movement has been used ever since the flat record replaced Edison’s cylinder. What about the stereo record? Each groove on a stereo record has two soundtracks cut into it, and they are cut into it both laterally and vertically. In order to pick up the two soundtracks, a stereo needle capable of moving complexly has been developed; it vibrates both laterally and up and down. Simultaneously, the lateral movement picks up one channel of recorded sound, the vertical movement the other. Think you can speak confidently about the intricate details of stereophonic sound? Think you’ve licked the volatile, short-lived, simultaneous ear experience? Over the next three days, The Prudent Groove will leisurely lift the contents of one coveted RCA Victor insert explaining, in intimate detail, exactly, What is STEREOPHONIC SOUND? The following is presented, without esteemed interruption, by The Prudent Groove. Part 2 will follow tomorrow. I’ll be completely honest and admit that I learned more than I thought I needed while transcribing this informative insert. Maybe RCA Victor was onto something. 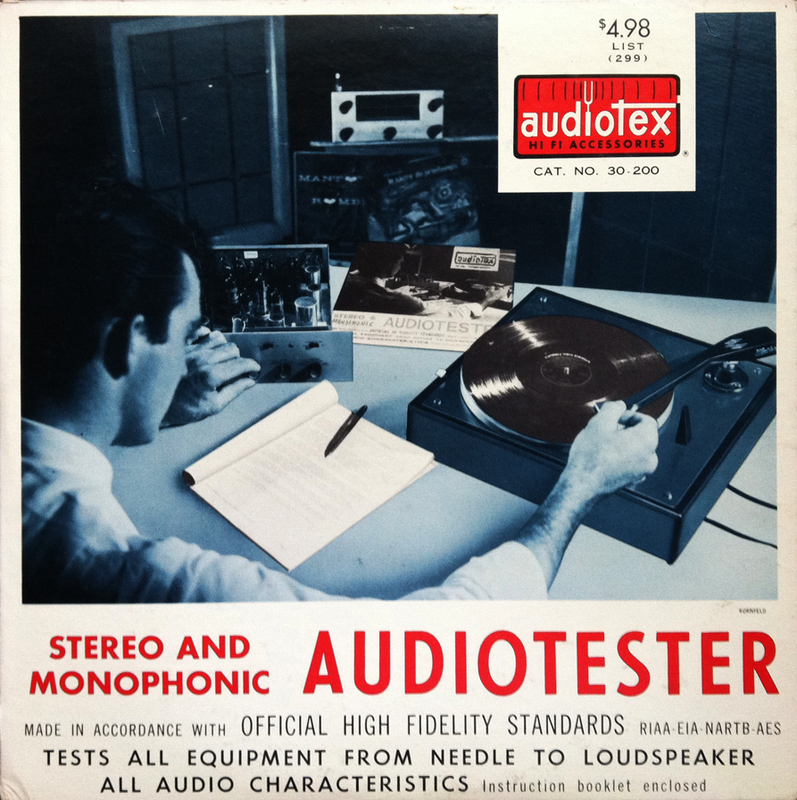 Stereophonic sound on records is finally here. It will be widely discussed, widely written about, and, perhaps, widely misunderstood. It cannot help but be; it is a complex achievement as well as an extraordinary one. We offer the following primer on the subject with the hope that it will both help you in understanding how and why stereo works and enhance the hours of listening pleasure stereo will offer in your home. Before stereo recording techniques were developed, the impulses of music were picked up by only one microphone. These impulses were then fed to one tape and from there to the conventional, monaural record, which you heard in your living-room through one loudspeaker. The conventional record offered brilliant sound and exciting sound, but, of necessity, it also offered only one-dimensional sound. Now, the simple and obvious fact remains that we all have two ears, and we are used to hearing things dimensionally. Generally speaking, your left ear has a tendency to hear what goes on in the left side of a room, your right ear, what goes on in the right side of the room. Your brain then does two jobs. It combines both the impression received by the left ear and that received by the right ear into one total impression which we call music. At the same time, it retains the spatial or dimensional impression, music to the left and music to the right.